In anticipation of Valentine’s Day, La Casita Cultural Center in the College of Arts and Sciences is presenting its third annual Música del Corazón (“Music of the Heart”) concert. FourteGuitar, a classical quartet from San Juan, Puerto Rico, will be joined by violinist Sara Silva G’07 and guitarist Kenneth Meyer for a special concert on Saturday, Feb. 13, at 7 p.m. at La Casita (109 Otisco St., Syracuse). The program includes two world premieres, as well as popular works by de Falla, Villa-Lobos, Rodrigo, and others. Open to the public, the concert benefits La Casita’s music and arts education programs, which serve nearly 90 children from the Near West Side neighborhood and provide University students with teaching experience. Admission is $10 for adults and $5 for students with ID. For more information, call 315-443-2151 or email lacasita@syr.edu. The concert is made possible by A&S and Crowne Plaza Syracuse. Paniagua is particularly excited about hosting Fourteguitar, featuring Jorge Calaf ’09, Félix Del Valle, Jehú Otero, and Lemuel Lugo. With performances throughout Puerto Rico and parts of the United States, the ensemble has endeared itself to critics and audiences alike. 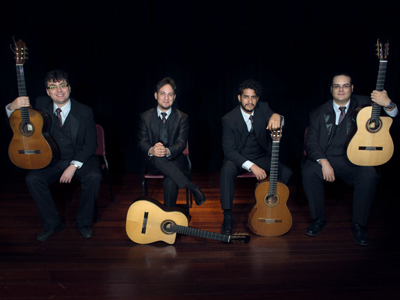 Their participation at the 2013 Celedonio Romero Guitar Institute at Oklahoma City University elicited praise from none other than Pepe Romero, himself, saying Fourteguitar has the potential—the “spirit and fire”—to be a great group. Rounding out the Feb. 13 lineup are Silva and Meyer, both of whom are no strangers to La Casita. Silva, who oversees and teaches in La Casita’s music education program, plays violin with Symphoria, the Orchestra of the Southern Finger Lakes, the Tri-Cities Opera, and the Binghamton Philharmonic Orchestra. 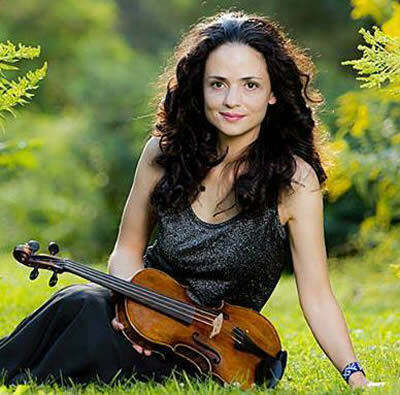 She also is a former member of the National Symphony Orchestra of Colombia in Bogotá. “It’s always fun to present this beautiful music for our audiences,” says Silva, who performed at last year’s concert. Meyer is a longtime instructor in the Setnor School of Music in Syracuse’s College of Visual and Performing Arts. Hailed as a “thinking man’s guitarist” (Washington Post), he has been described as “impeccably articulate, with superb technique” (The Buffalo News). Meyer frequently appears as a recitalist, chamber musician, and orchestral soloist throughout North and South America and Europe. He also is a fixture on the summer festival circuit, a popular lecture-recitalist, and an Albany Records recording artist. The program features the premieres of “Campanas en Primavera” by Juan Sorroche, a guitar professor at the University of Puerto Rico, and “La Gran Bomba,” a former instructor at the Puerto Rico Conservatory of Music.